Delhi Dynamos earned a hard fought 1-1 draw against league leaders Atletico de Kolkata in a match that had a bit of everything. Spaniard Joffre scored from the spot for Atletico de Kolkata and Pavel Elias scored a brilliant goal for Delhi Dynamos from outside the box in the second half to level the game. Atletico de Kolkata created a few good chances, but failed to convert them after a solid display from Delhi Dynamos goalkeeper Van Hout. After consecutive wins league leaders Atletico de Kolkata hosted Delhi Dynamos at the Saltlake Stadium in Kolkata. Spaniard Borja Fernandez was suspended for the game, after he picked up two yellow cards against North East United. Atletico de Kolkata manager Antonio Lopez Habas replaced him with Jakub Podany in the starting XI. Kolkata maintained their 4-4-1-1 formation for the game, with Joffre taking up the central midfield role. For Delhi Dynamos, Alessandro Del Piero started the game as both Mads Junker and Morten Skoubo were relegated to the bench as the team played a 4-3-3 formation. Kolkata started where they left, and just like last match, skipper Luis Garcia played a lovely lofted ball for Fikru, who was judged offside by the linesman. Moments later, Italian legend Alessandro Del Piero was booked for simulation inside the penalty box. Replays showed it was a good decision by Indian referee Santosh Kumar. Once again, Luis Garcia was running the show for Atletico de Kolkata in the early stages of the game. Moments later, a sneaky pass from Baljit Sahni was almost met by Garcia, but Delhi Dynamos goalkeeper Van Hout came out to collect the ball to keep the score 0-0. After 20 minutes, a sloppy pass from Mulder allowed Fikru through on goal, but Delhi Dynamos goalkeeper Van Hout came out to save the shot. The Belgian goalkeeper just did enough to keep the score 0-0. Around the half hour mark, Joffre smashed the ball towards the goal, but was deflected and went out for a corner. There was end to end stuff in the first half an hour of the game, as home side Atletico de Kolkata came close to scoring a couple of times. 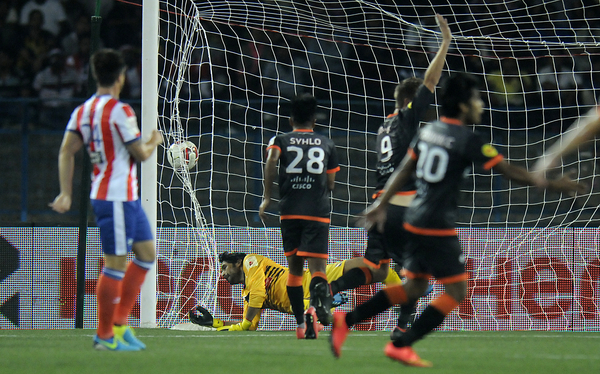 Delhi Dynamos came close to scoring after 32 minutes when Shylo’s long range shot hit the crossbar and went over. Kolkata not as impressive as in the first two games, were playing their third game in seven days. The score ended 0-0 in the first half, with none of the sides dominating the game. Atletico de Kolkata owner Sourav Ganguly addressed the home crowd before the start of the second half and skipper Luis Garcia was substituted in the second half after he suffered a hamstring injury for Indian international Rakesh Masih. Fomer Liverpool man Josemi pulled on the armband for the rest of the game. Atletico de Kolkata got a penalty early in the second half, after Raymaekers pulled Fikru's shirt inside the penalty box. Spaniard Joffre did no mistake to convert the penalty to make it 1-0 for the home side. Soon, Dutch midfielder Mulder took a shot inside the penalty box, after some delightful play by Arias and Fernandes, but that went over the crossbar. Around the hour mark, Fernandes was replaced by Steven Dias for Delhi Dynamos. Kolkata looked more threatening after their first goal, Podany had a brilliant effort from outside the box and Baljit Sahni failed to convert the rebound. Soon, a delightful one-two between Rakesh Masih and Joffre almost resulted a goal, but Van Hout once again made a brilliant save to keep his team in the game. Delhi Dynamos made a tactical change as Mads Junker came on for Raymaekers. Delhi now played three at the back and the change worked for the away side as defender Pavas Elias scored a stunner from outside the box to make it 1-1. Atletico de Kolkata conceded their first goal of the tournament. Soon, Arnal danced through the Delhi defense and put in a dangerous pass inside the penalty box, but none of the three Kolkata attackers could get to it. Atletico conceded points for the first time in the tournament. Pavel Elias was judged the Man of the Match for his stunner in the second half and for his overall play.